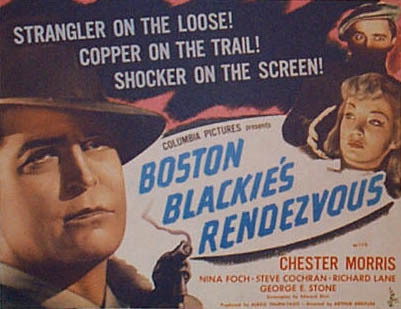 This is the ninth movie in the Boston Blackie series and is considered one of the best. Blackie hunts for an escaped lunatic on a murder spree. Blackie, The Runt, Farraday, a pretty girl and a strangler; could it get any better? 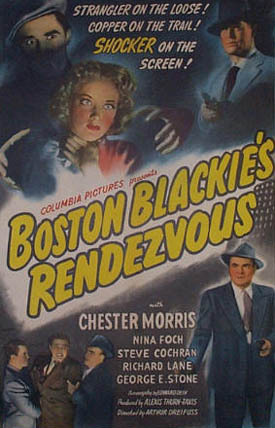 In this film, (alternate title Surprise in the Night) which is one of the best of the "Boston Blackie" series, reformed safe-cracker Boston Blackie (Chester Morris) and his sidekick The Runt (George E. Stone) are visited by Blackie's friend, millionaire Arthur Manleder (Harry Hayden), who frantically begs Blackie to help him locate his nephew, Jimmy Cook (Steve Cochran), a homicidal maniac who has just escaped from a sanitarium. Jimmy knows Manleder has asked Blackie to find him. Jimmy talks to Blackie but it does not go well and Jimmy tries to strangle Blackie, knocks Blackie out and steals his clothes. To intimidate Blackie, Jimmy, psycho killer and strangler, kidnaps dance hall hostess Sally Brown (Nina Foch). Now Blackie and The Runt try to find Jimmy. Of course when Inspector Farraday (Richard Lane) finds evidence pointing to Blackie suggesting he is the strangler, Farraday is hot on the trail to arrest our hero. Add to that a couple of dead bodies along the way, and now Farraday also suspects Blackie of murder. Unfortunately, Martha, the one person who can substantiate Blackies innocence, was frightened and skipped town. Sound Department: Philip Faulkner Jr.
Reformed safe-cracker Boston Blackie is visited by his friend, millionaire Arthur Manleder, who frantically begs Blackie to help him locate his nephew, Jimmy Casey, a homicidal maniac who has just escaped from a sanitarium. As Manleder recalls the boy's case history, Jimmy listens from a fire escape outside Blackie's hotel room window. After Blackie goes to bed, Jimmy sneaks into his room and denies his uncle's charges, claiming that Manleder has concoted the tale to disinherit him. Blackie counsels Jimmy to go back to the sanitarium, and as he phones the hospital, Jimmy chokes him unconscious and then steals one Blackie's suits. As Jimmy changes his clothes, a diary drops out of his pocket. When Blackie's sidekick, The Runt, returns home, he finds Blackie lying on the floor, barely conscious. After finding a newspaper clipping about dance hall hostess Sally Brown tucked in the diary, accompanied by Jimmy's declaration of love, the pair hurry to the dance hall where Sally works. There they are informed by Martha, the ticket taker, that Sally has the night off and that Jimmy left with Patricia Powers, another hostess. After discovering that Jimmy hailed Steve Caveroni's cab, Blackie and Runt ask Caveroni to take them to Jimmy's destination. When Caveroni drives them to a deserted spot along a country road, Blackie steps out of the cab to investigate and is met by his nemesis, police inspector Farraday, who informs him that Patricia's dead body has been found in the underbrush with Blackie's hat at her side. 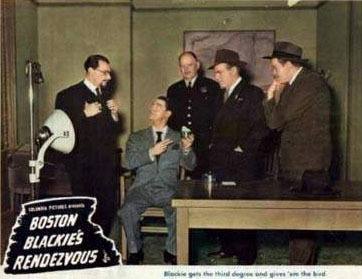 Refusing to accept Blackie's explanation about Jimmy's visit, Farraday arrests the ex- convict and takes him to police headquarters. Meanwhile, Jimmy has returned to Blackie's hotel room and is in the process of writing a note to Sally, arranging a rendezvous at her apartment that night, when the maid enters the room. Jimmy strangles her just as Blackie and Runt, who have been released for lack of evidence, return to the hotel. Realizing that Sally is in great danger, Blackie poses as her grandmother and phones the dance hall to obtain her address. Blackie proceeds to Sally's apartment, and when Jimmy sees him enter the building, he hides in the hallway. Sally opens her door, and mistaking Blackie for her secret admirer, invites him in. Meanwhile, at the dance hall, Farraday questions Martha, and when he learns that Sally is her roommate, he warns her that Sally is in jeopardy. Martha then calls Sally, who thinks that Blackie is the strangler and screams. At that moment, Farraday and his men arrive at Sally's apartment, and as Farraday breaks down the door, Blackie climbs out an open window and escapes. After reassuring Sally that she is safe, Farraday and his men depart. Jimmy, still lurking in the hallway, approaches Sally and, posing as Blackie, suggests that she would feel more secure at his apartment. When Martha appears, Jimmy instructs her to tell Farraday that they are at Blackie's hotel suite. Soon after, Farraday returns to Sally's apartment, and Martha gives him the message. At Blackie's suite, meanwhile, Blackie and Runt are packing their suitcases to hide out at Manleder's house when they find the maid's body in the closet. When Farraday arrives, he refuses to believe Blackie's story that the strangler has been impersonating him. Martha, the one person who can substantiate Blackie's claim, has fled town in fear. 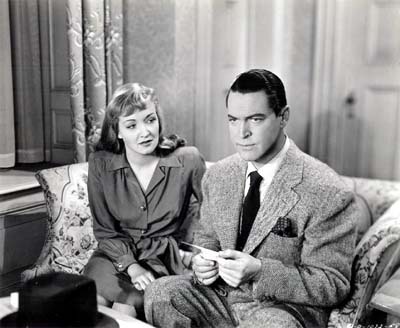 After Farraday arrests Blackie for the maid's murder, Blackie and Runt again escape the inspector's clutches, and Blackie, realizing that the killer must be registered at the hotel, steals the registry cards and compares the signatures to Jimmy's handwriting. When Blackie discovers that Jimmy is registered on his floor, he and Runt proceed to the room and begin to break down the door. After alerting the desk clerk of an intruder, Jimmy escorts Sally out a side door and takes refuge in Blackie's suite. Farraday rushes from the lobby to Jimmy's room, where he finds Blackie and Runt and arrests them. Soon after, Martha returns to town and verifies that someone has been impersonating Blackie. Meanwhile, at Blackie's suite, Sally sees a photograph of the real Blackie and becomes suspicious. When Jimmy admits that he is not Blackie but her secret admirer, Sally grabs for the phone, and the desk clerk notifies Farraday that someone is in Blackie's suite. Blackie and Farraday then rush to the suite, where they are confronted by Jimmy, holding a gun on Sally. In tandem, the two men yank the rug out from underneath Jimmy's feet, knocking the killer helplessly to the floor, and Farraday then arrests him.